ICE72002 : Iceberg Iceberg Snapease Computer Desk - Rectangle Top - 24.50" Table Top Length X 42" Table Top Width - 30"
Iceberg Snapease Computer Desk - Rectangle Top - 24.50" Table Top Length X 42" Table Top Width - 30"
Sturdy, Durable Computer Workstation Is Made Of Blow-Molded, High-Density Polyethylene That Is Dent-Resistant And Scratch-Resistant. It Won'T Chip Or Rust. Comfortable Design Features Angled Sides. 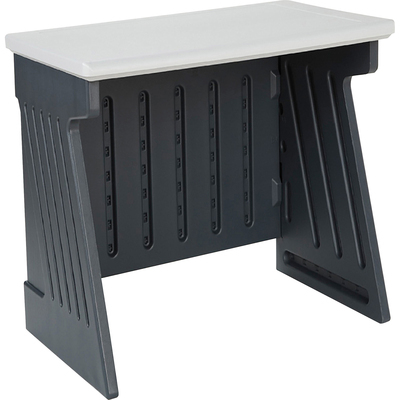 Easy To Disassemble And Store, The Computer Workstation Offers Washable Surface And Easy, No-Tools Required Assembly..
Sturdy, Durable Computer Workstation Is Made Of Blow-Molded, High-Density Polyethylene That Is Dent-Resistant And Scratch-Resistant. It Won'T Chip Or Rust. Comfortable Design Features Angled Sides. Easy To Disassemble And Store, The Computer Workstation Offers Washable Surface And Easy, No-Tools Required Assembly.